Your colon is meant to push undigested food - waste - out and allow the body to absorb healthy nutrients and minerals. Skinny Bean Oxygen Detox Cleanse uses the power of oxygen to safely and effectively melt away the compaction from your small intestine, large intestine, and colon. Cleanses and detoxifies your entire digestive tract. Relieves bloating, gas and occasional constipation. On average, a colon can contain 6-8 meals before pushing it out. Not eliminating waste but building it up is unhealthy and may cause occasional constipation, bloating, and feelings of being low in energy. Skinny Bean COLON DETOX Best Natural Body Detoxification to Lose Weight Ultimate Total Kidney Detox & Liver Cleanse Detoxify Your Body With These Super Potent Cleanse Pills. Our high-quality extra strength detox pills are the perfect supplement for fast weight loss and constipation relief (detox cleanse weight loss). They are 100% safe, powerful and carry no side effects. Works well with garcinia cambogia and forskolin. This colon cleanses gently and naturally flushes your system to eliminate pounds of toxins & waste this greatly improves your overall stomach function (not to mention lose some stubborn belly fat). 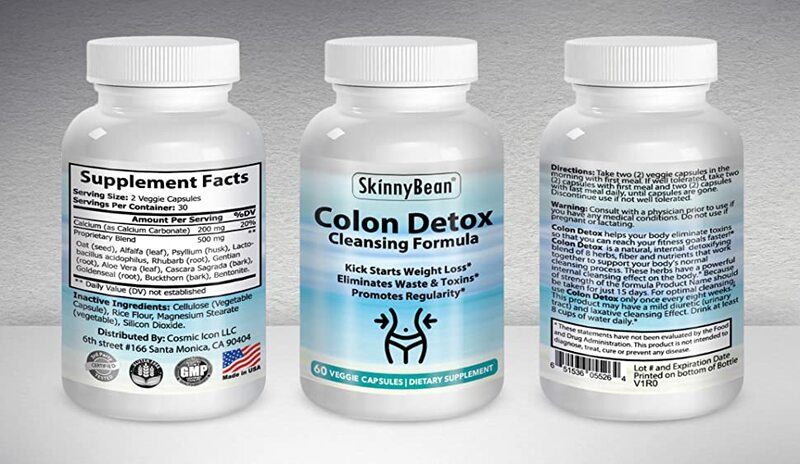 Skinny Beans Colon Cleanse helps your body absorb vital nutrients & vitamins, have regular bowel movements & get rid of the unwanted extra weight! It's time to feel cleansed, detoxified, and lighter. Thanks for stopping by, If you don’t give this detox a try that's ok, all the best to you. Oat (seed), Alfalfa (leaf), Psyllium (husk), Lactobacillus acidophilus, Rhubarb (root), Gentian (root), Aloe Vera (leaf), Buckthorn (bark), Bentonite. PARTY GIRL™ Liver Cleanse Detox Formula.